Dr. Gina Sam is one of New York’s leading gastroenterologists, with the sterling credentials you’d expect – earning a combined degree in medicine and public health at Tufts University Medical School’s competitive four-year program. 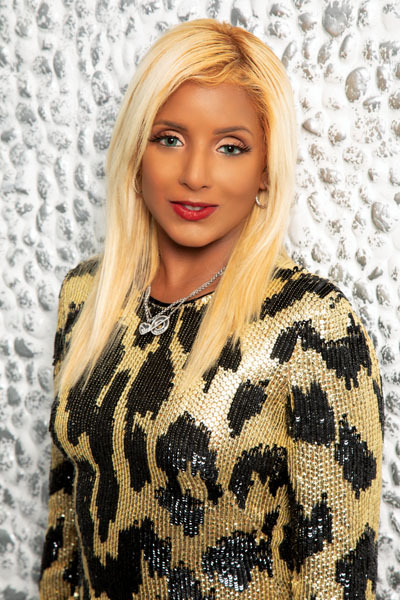 She is also passionate about raising awareness about colon cancer and gastric cancer, and is a fierce advocate for women’s health issues, particularly fighting abuse. 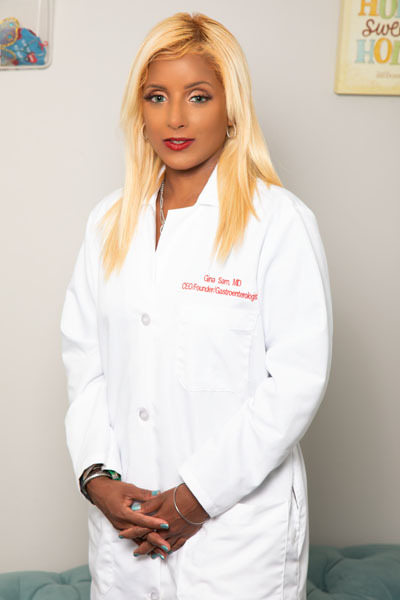 Born in Trinidad and Tobago, Dr. Sam’s family moved to the U.S. when she was age nine, and she attended New York City public schools, and did her undergraduate studies at NYU, majoring in chemistry. The reason she was so intent on combining public health studies with medicine is because of her immigrant background; she wanted to aid underserved populations, especially in the Caribbean. She specialized in public health and community health, completing her MD/MPH program plus a year of research in five years. “It was a very intense program, but I think it really differentiated me and made me realize the impact of being a physician, but also being somebody who can make a difference in communities,” Dr. Sam says.A residency at Lenox Hill Hospital in New York and a fellowship at NYU followed, and then she joined Stony Brook University, building its gastrointestinal motility center. Next came a stint as director of Mount Sinai Hospital’s motility center, and teaching at its medical school. Most recently, she opened her own private practice in midtown Manhattan. While in medical school, Dr. Sam did an internship at the Boston Department of Public Health where she worked on the campaign to ban smo king in restaurants. “I had this desire to do public health in addition to being a physician because I wanted to have a larger impact on the population, in addition to patients,” she says. At her recently opened private practice in Manhattan, Dr. Sam merges her medical expertise with various hand-picked partners offering wellness and personal services for an integrated whole-body service. Think personal trainers, acupuncturists, massage therapists and beauty and style consultants. She is an expert in a specialized niche called “gastrointestinal motility,” which involves dysfunctions of the intestinal muscles. “Very few people have the skills as well as the ability to do this niche because it involves specialized technology,” she explains. “And these include diseases that are unusual, very rare.” She also treats more common conditions like reflux and IBS, and screens patients for colon cancer. She is one of very few physicians offering Stretta, a treatment for people suffering from excessive acid reflux. The procedure is a balloon placed into the esophagus, which uses heat to reduce reflux. “It’s a better option for patients because it’s not invasive – it’s not a surgery – and requires less healing time and is safer,” she says. It takes about 45 minutes. Dr. Sam does a lot of outreach work with medical students in the Caribbean, and she is starting her own foundation, setting up a gastroenterology mental health clinic on the island of St. Lucia, promoting health awareness and performing procedures like screening colonoscopies. This project was, in part, spurred by personal tragedy. Dr. Sam’s sister was killed in the World Trade Center on 9/11, in 2001. Her sister, an accountant, was three months pregnant at the time. “You never get over a trauma like that,” she says. She has planned a pair of buildings that will resemble the Twin Towers – on a much smaller scale, perhaps nine stories tall. There will be condos for doctors’ offices, some shops and a restaurant, plus an emergency room for the local population, and a GI suite with hospital beds. In the Rodney Bay area, in the north of island, which is where many of the tourists go, there’s really no travel hospital, Dr. Sam notes. She also hopes to dedicate some space for art displays and musical performances, since such venues are lacking in the community. She has the support of the local government, and has secured the land and business partners, and expects the buildings to be completed by 2023. More immediately, Dr. Sam is opening an office in the Rodney Bay area in late 2018, and will split her time between St. Lucia and her practice in New York. She’ll have trained staff down there to provide primary care and handle emergencies, and she will also be able to consult with patients via telemedicine. She will duplicate the services available at her wellness center in New York. One area very close to her heart is fighting abuse – in the workplace, in the home, child abuse, and she will be addressing this in her foundation.